The climb up Alpe di Siusi was not much better, but some kilometers in, there was a check-post and a sign that said it was prohibited for cars to continue, unless you had a room in a hotel at the summit. I went on alone initially, but a bit later Paula decided to take the chance and ride on anyway, so she catched up with me again. It was surprisingly busy at the summit, mostly hikers and some mountain bikers. We had a sandwich and went down to Castelrotto. 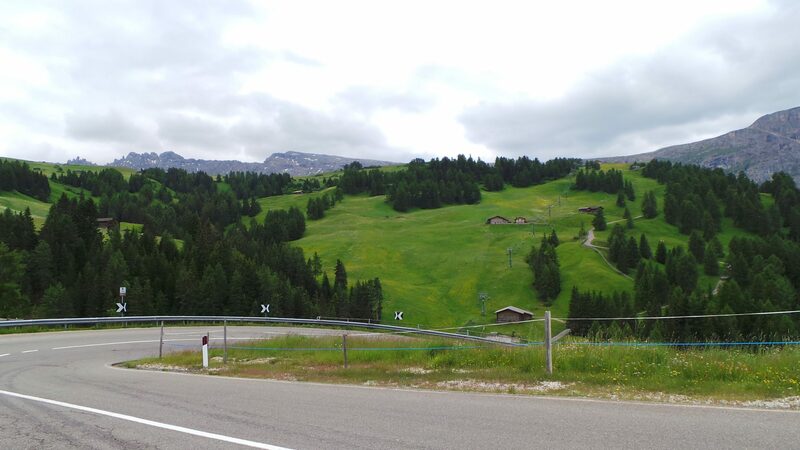 From there, I climbed the (remainder of) the Pinei, descended towards Ortisei and climbed back up through Val Gardena, for the remainder of the Sella, i.e. keeping right at Plan de Gralba instead of turning left to the summit of the Gardena.